In my adventures I’m fortunate to meet some wonderful like minded creative souls. Most of us in this industry are largely self directed solo acts in making. I love the inside head space I fall into while working, sometimes though it can be a wee bit lonely. I use various social media to bounce ideas, voice frustrations and share life with others of the same ilk. I like to think of it as taking a break at the water cooler. These breaks a rewarding and I’m amazed at the friendships I have grown online. One of my favorite parts of attending these festivals is meeting those folks whose work or wit I have admired online. Last year I was able to attend a retreat where I was able to do so, but without the stress and chaos that accompanies a fiber festival. Spending a few days with Kim (Indigo Dragonfly) and Bristol (Bristol Ivy Designs) we decided to collaborate on a project. Over the last year we have exchanged ideas, emails and samples and we’re quite pleased with the finished result! Troika will be available in kits in each of the two color ways in my booth at Rhinebeck. 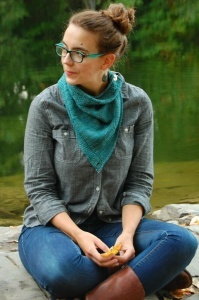 The kit will include enough of Kim’s yarn to make the cowl, Bristol’s design, and four buttons in either porcelain or copper as desired. Here’s my contribution. I can’t wait to knit one myself! This entry was posted in Uncategorized on October 16, 2014 by Jennie. I love this! 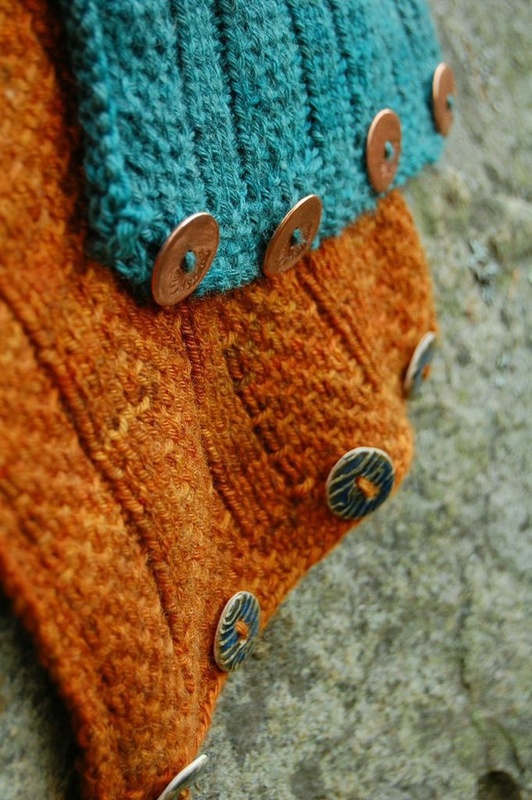 Ordered the rust with the porcelain buttons but am thinking I should have done the reverse!